We met in Australia in 1991 whilst working in the offshore oil exploration industry. Shortly afterwards we decided to head to Europe in order to pursue employment on super-yachts. Our search took us from Europe to the Canaries and finally to the Caribbean where we had limited success. A yacht delivery from Antigua to Spain in 1996 landed us in Mallorca, which would become our home for 19 years. During this time we both returned to the offshore oil industry, which afforded us the time and finances to travel the world in pursuit of a second home to escape the European winters. In 2009 we bought a condominium in Las Vegas, Nevada and spent the next six years transiting between Spain and the US. In 2015 we decided to leave the Spanish winters behind in search of year-round sunshine and, long story short, we accidentally found the Republic of Panama. So, we purchased a condominium within walking distance of our favourite bar (Balboa Yacht Club), officially became Panamaniacs, and the rest, as they say, is history. Today we spend our time watching Panamanian wildlife in our garden, assisting yachts through the Panama Canal, or cruising the seven seas in search of the next paradise. Russell has been an RYA Yachtmaster since 1996 and Diane completed NZ yachting certificates as well as NZ Commercial Launchmaster in 1993. 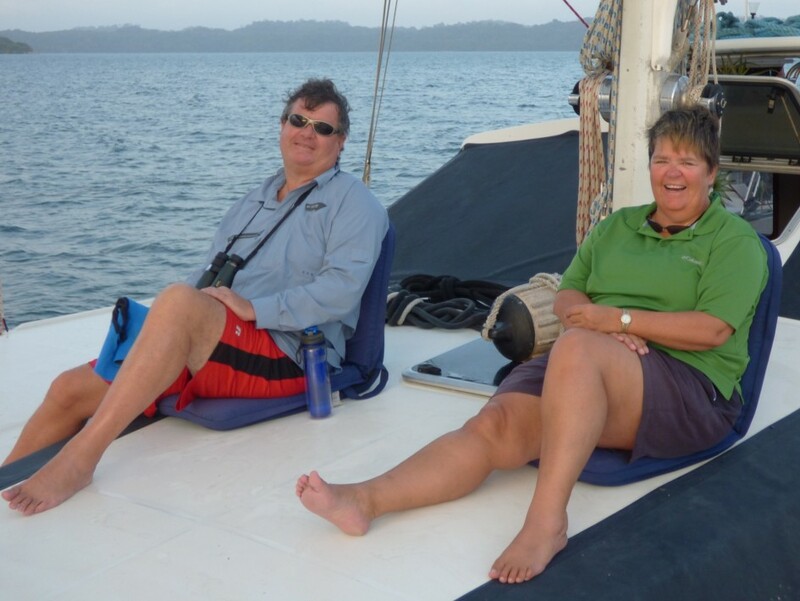 Diane spent most of her youth dinghy sailing, and spent many years involved in the Spirit of Adventure Trust (square rig youth sail training), as well as some time as professional crew on a megayacht. Between us we have been involved in many long and short-haul yacht deliveries. Sailboats from 32′ to 160′, including square-riggers and several Atlantic crossings. We also have a combined experience of 55 years in the global offshore oil exploration industry, obtaining an abundant amount of safety training along the way.